Some kids are lucky enough to have a playhouse or a tree house. Wouldn’t it be fun to live in your own “luxury” playhouse—a beautiful, tiny house, with everything? Some people are making this childhood dream come true. They are living in the tiniest possible houses. Some of these houses are less than 100 square feet—that’s a house just 10 feet wide and 10 feet long! They have a bed, a kitchen, a bathroom with shower, comfy chairs, a desk or table, and room to store clothes, shoes, books, CDs, and other stuff . . . but not too much other stuff. They are inexpensive to maintain. Utility bills (electricity, water, heating gas or oil) are tiny. They are quick and easy to clean. They are very efficient—everything is within reach. They make a tiny carbon footprint compared to regular-sized houses. Maybe most important, people who live in these houses say they feel free! They don’t have to spend all their money to pay for the house. They don’t have to spend all their time fixing and cleaning the house—or earning the money to pay for the house. 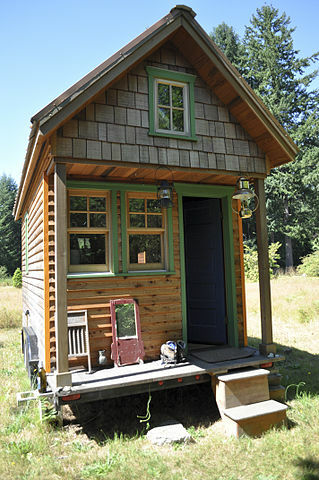 Maybe we should all think about down-sizing to a tiny house. There are many different types of tiny houses. 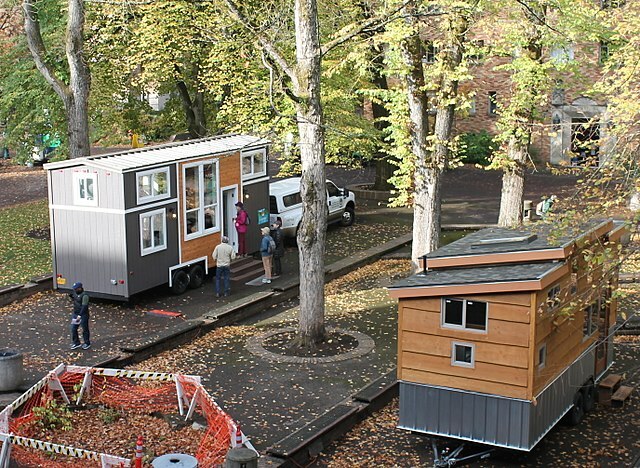 These particular tiny houses are built on trailers so they're easy to move. Credit: Dan David Cook via Wikimedia Commons. This house has 117 square feet of living space. Credit: Tammy via Wikimedia Commons. 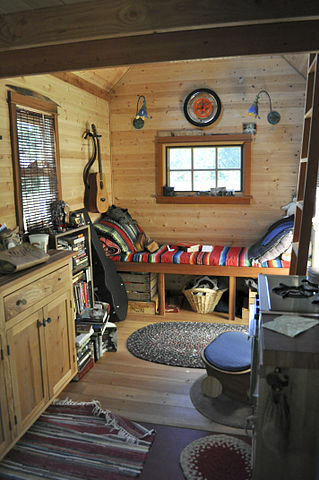 The interior of the same 117-square-foot house. Credit: Tammy via Wikimedia Commons.